This year save time and let us cook your holiday meal for you. Elijah’s Restaurant and Catering offers a great selection of traditional Thanksgiving dishes that are sure to make Thanksgiving, 2018 unforgettable. 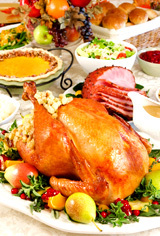 All Thanksgiving Dinners will be made-to-order at the time you request. You can pick up your fully-cooked feast at either of our two San Diego locations or delivery can be arranged for an additional fee. Your food will be served in disposable aluminum containers so it will be easy for you to keep it hot or re-heat if necessary. You and your family can enjoy a delicious feast without the hassle! Elijah's Thanksgiving Turkey Dinners include all the trimmings: old fashioned stuffing, whole berry cranberry sauce and a rich turkey gravy. A great alternative or addition to the traditional turkey is our tender ham or juicy prime rib (served with creamy horseradish sauce). You can mix and match our side dishes and homemade pies to create your own Thanksgiving Feast your family and friends are sure to love! Our Thanksgiving Whole Turkey Dinners are the result of several years of cooking perfect whole turkeys for our customers. The turkey is stuffed with a special mix of berries, fruits and stuffing, marinated for over 24 hours to ensure a juicy, flavorful turkey. With the large selection of side dishes, you can please your guests with a variety of options. If you would like additional appetizers, soups, salads, or desserts, you can always order from our catering menu or just call our direct line at (858) 353-5528 and we will be happy to help you.